Eyenurse, a Beijing startup that we meet and interviewed not long ago. We were quite interested in their recent growth and product, 1.6 million vibrating stick sold. Yes, a vibrating and heating stick, with a simple purpose, taking care of your eyes’ health! And so after meeting them, talking about their goal and innovation and mainly about their solution, we acquire one and used it for some weeks and finally, here is our review. The eyenurse comes in a small luxury-style box. Small black rectangle with silver writing on top, inside a travel pouch and notice are included, with, of course, the recharge cable. A quite interesting, it feels big and efficient in your hand but light and weak at a first look. Its curved shaped with a silver tip that gives it an interesting and nice look. Something special is coming from it. 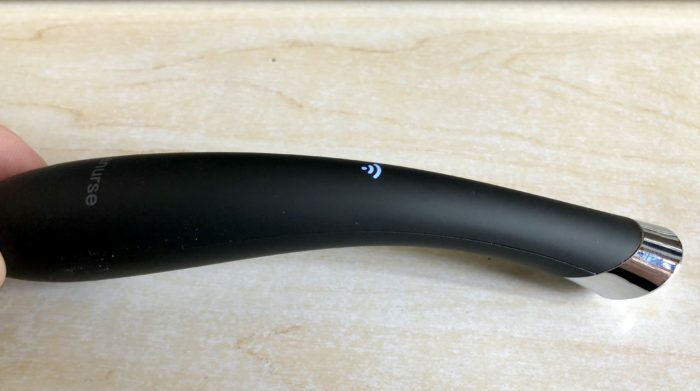 Basically, it’s a black stick with a metal tip, and a Wifi logo blinking when starting it. Simple and effective design. The usage learning path is really easy in this case, you understand quickly the need to touch the metal handle under it to start it and that’s it! So, take it in your hands, have or not the app open on the side, and touch the skin under the eye. That’s it, the eyenurse knows when the app is open (Bluetooth), will sync with it and show how to control it. It’s working without it the same way and will still keep track of your health. It’s a complete solution. Classes, tutorials and tips to improve your health are provided. But not only, statistics on your eyes and usage are also there. Everything with the same goal, make your eyes feels nicer. Follow the instruction shown on screen for maximum performance, it will totally guide you through the massaging process. Timing the utilisation and showing where to massage. Even no need of keeping your eyes open, an audio recording will tell you when and where to change position. A strange feeling is experienced during the first time. You are moving something vibrating and hot around your eye. Of course, you control it but still it feels different. After a few seconds of adaptation, you really get along with. Using it correctly gives only pleasant result, feeling your eye relaxing and get the sensation of a massage. The hydration part is also a true aspect here, eyes get wet when using it, by vibrating it activate the mechanisms behind the tears, and without making you cry it’s like blinking a thousand times. The recommended usage time is quite long, it’s a few sessions of three minutes or more. I never really use it this much. It’s on my desk and whenever my eyes don’t feel so good or I thought about it, I use it a minute or two. The companion app gives reminder quite often and maybe I should listen to it more carefully, there are doctors and medicine facts behind. I was really septic at the beginning and I was not the only one. Many of my friends were like this thing is useless, it will not do anything, classical reaction about a different product. 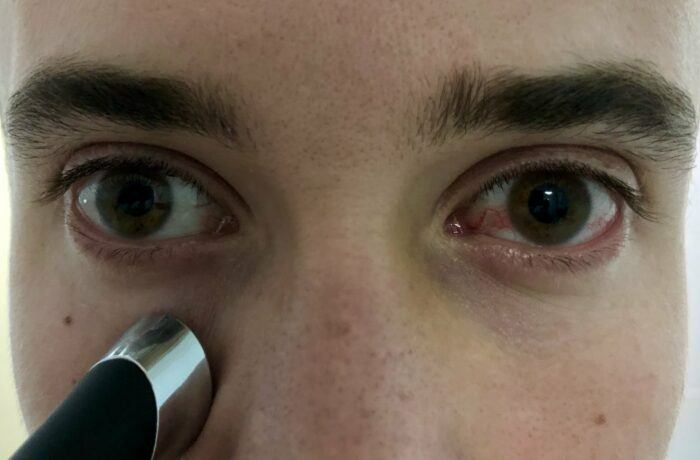 I set a simple experiment, for one day I will massage my right eye multiple time and not the left one. I spend most of my day behind my computer or my phone, so it is quite relevant set-up. During the day I massage my right eye four or five times while using the computer or during a break. I didn’t stop what I was doing but was doing it as the same time. Each time around one or two minutes so still less than the recommended time and result is as far as we can see, really good. I don’t think everyone needs this solution but the claimed result and health improvement are true and might solve a bunch of your issues. Eyenurse is an innovative startup with strong medical background and support, they definitely know what they are doing and what you might need. If you have ever issued eyes dryness problems, pain or trouble vision, take a look at it. Go on their website for more technical details information and details on whether the device and the app, or to buy it!